The familiar saying is that March can start in one of two ways: like a lion or a lamb. Unfortunately, this year it has come in roaring like a lion, with the occurrence of a very active outbreak of severe weather that has moved across the southeastern U.S., spawning numerous tornadoes (Filter NOAA Storm Reports suggest 39 tornadoes). The hardest hit areas seem to be Beauregard and Smith Station, AL, with initial damage reports suggesting the tornado travels 67 miles with a maximum width of 1 mile and had a maximum intensity of an EF4 tornado with 170 mph winds. So far this tornado was the cause of all 23 reported fatalities. The Talbotton, GA, tornado could have also experienced a low to mid-level EF4 (166 – 200 mph) tornado and could actully be part of the same tornado that tracked over Beauregard and Smith Station, AL. Cairo, GA experienced an EF2 (120 mph) tornado, but data will continue to be analyzed before finalizing the rating. Overall, reports (only 16) of severe hail and other winds associated damage (62 reports) with this severe weather outbreak were relatively limited, but some insurance loss could result from these perils as well. BMS iVision ingests filtered National Weather Service Observations of Severe Weather so clients can quickly get a view of impacted risks using one of the many Scenario View tools. After the Weather Service conducts damage swaths these can also be made available in iVision for deeper analysis. The catalyst for this event was an area of low pressure moving across the Lower Mississippi Valley toward the Mid-Atlantic coast. In fact, if you look at the temperature anomaly from yesterday afternoon, it was a classic signature of a large tornado outbreak, similar to the late-April Tuscaloosa tornado outbreak of 2011. With record cold occurring in the north-central plains and ample warm moist air along the southeast feeding off the above-normal Sea Surface Temperatures (SST) in the Gulf of Mexico, the pattern is set for severe weather. The National Weather Service Storm Prediction Center in Norman, OK (NWS) had issued a statement prior to the outbreak indicating that, given the buoyancy and intense shear profile in place, tornadogenesis would likely occur within 30 – 60 minutes, with the possibility of a strong tornado occurring after 1:00 p.m. CST. The Preliminary lead time from the concentrated areas of damage in Smith Station is estimated to be 8-9 minutes. Sadly, many people lost their lives even with this ample warning. With the death toll currently at 23 and potentially still rising, this tornado outbreak is the deadliest since May of 2013 when 24 people were killed in Moore, OK, and the deadliest day for tornadoes in Alabama since 2011. Given the rating of the Smith Station, AL tornado is now an EF4, this ends the remarkable drought of an EF4 tornado. According to the source, U.S. Tornadoes Violent tornadoes have caused 63.1% of all deaths despite the only accounting for 1% of all tornadoes in the historical record. This chart has been featured in several BMS Insights blog post highlighting the lack of major tornadoes over the last few years. This chart will now have to be updated given the Smith Station, AL tornado has been rated an EF4 by NWSBirmingham. 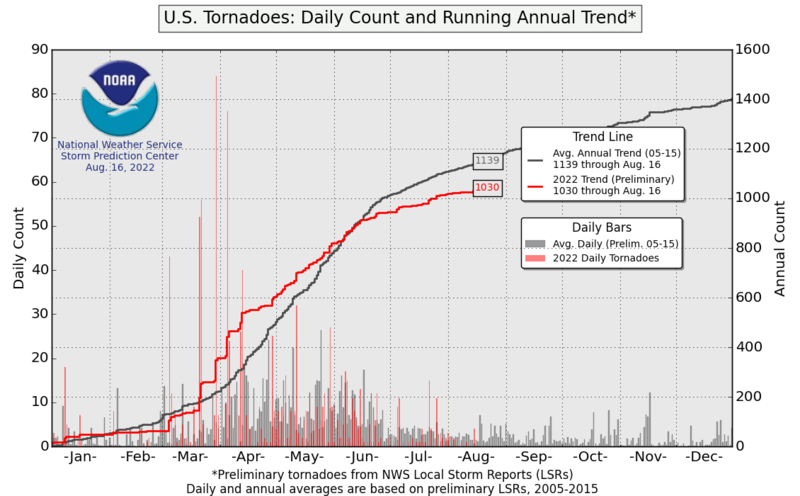 The EF4 tornado drought has officially ends at 672 consecutive days. The longest such streak in the United States since 1950. It is notable that the prevalence of images of driveways with debris everywhere, but no indication of foundations, suggests a large number of mobile homes were likely in these locations, perhaps contributing to the loss of life. Mobile homes tend to be lighter and have much less stable foundations than a typical single family home. In fact, data from Stephen Strader and Dr. D.S. LaDue shows there are very few community tornado shelters in the part of Alabama hit by the tornadoes. Mobile homes are a big part of the housing stock across the deep south which is troubling, as even the weaker tornadoes or strong wind storms can destroy such structures. When you combine this with the huge growth in exposure to the tornado hazard across Dixie Alley, the insurance industry is bound to continue to experience loss from events like this into the future, even if it has been some time. Unfortunately, the forecast calls for another storm systems later this weekend and another duing the middle of next week that could lead to more outbreaks of severe weather. 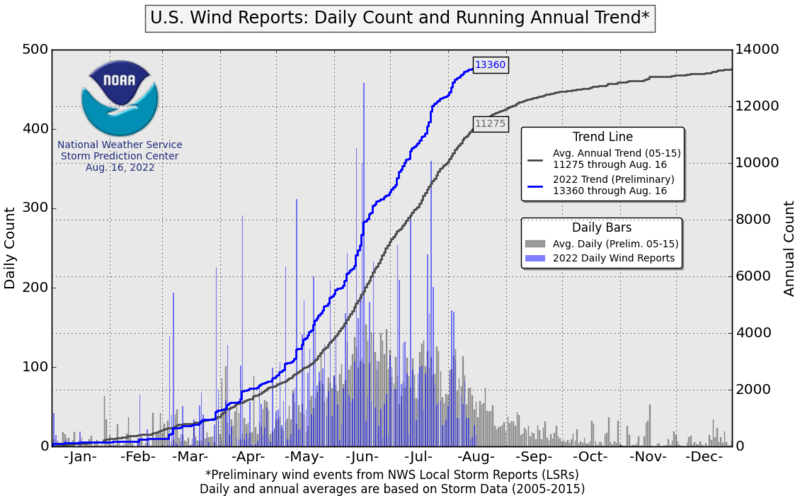 In fact, last week the large forecasting company AccuWeather predicted 1,075 tornadoes will occur in 2019. This is a bold prediction that has drawn some scrutiny as being very unscientific. 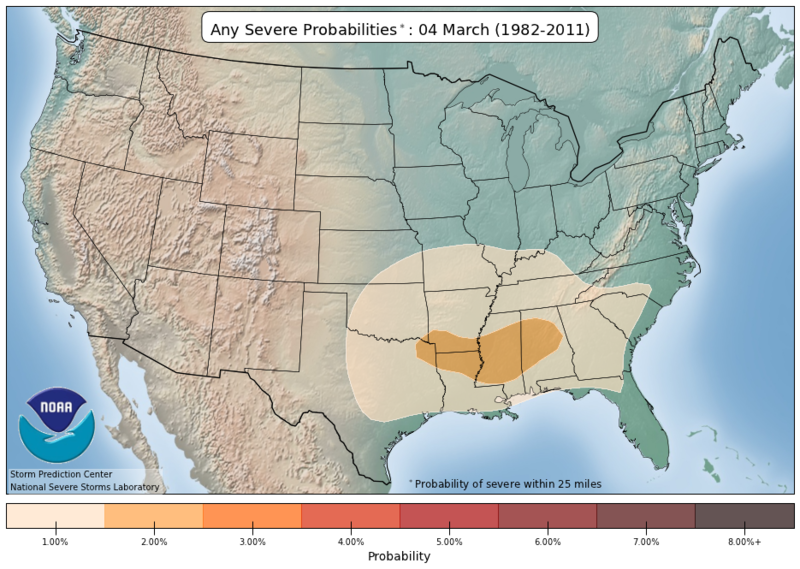 It is expected severe weather usually occurs across Dixie Alley in the early spring, as this is the climatological peak for storms before the focus shifts to the central plains. AccuWeather believes warmer-than-normal SST over the Gulf of Mexico will lead to increased moisture transport from the Gulf over the region and, ultimately, a higher frequency of severe weather this season. I think the forecast is, bold, but the insurance industry needs companies and other researchers to push forecasting, but also state the uncertainties in such forecasts as guidance is feasible at longer lead times, but there is substantial variability. A number of factors that influence seasonal tornadoes include the state of the El Niño Southern Oscillation, Pacific and Atlantic SST profiles and seasonal wind shifts like the Madden-Julian Oscillation or the global wind oscillation. For the upcoming season, there is a weak ongoing El Niño event which, typically, implies the unstable conditions favorable to tornadoes are less likely over the Great Plains. But the Gulf of Mexico is exceptionally warm, and I know first-hand the snowpack over the northern plains and Rocky Mountains are healthy, which suggests more instability over the U.S. Only time will tell how this plays out, but the tornado drought appears to be over, and insurance companies are, yet again, facing loss from the raw destruction that can occur from severe weather. Predicting a hurricane season is risky business, and a few egos may have taken blows this past season. That is, at least until April when the majority of 2019 Atlantic Named Storm forecasts will be made and the 2018 Atlantic season becomes a distant memory. Almost all hurricane predictions from spring (including mine) failed, as they called for normal to below normal Atlantic Named Storm activity. 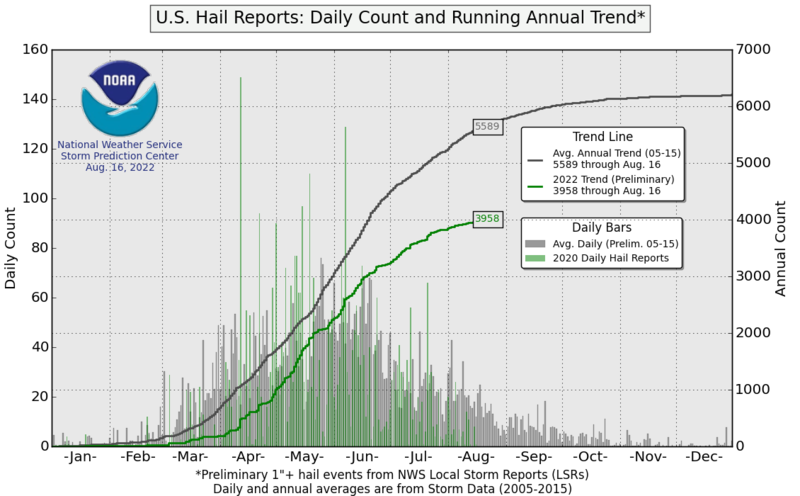 Even the early August forecasts, which account for a good chunk of the hurricane season, failed to deliver. In total, there have been 15 Named Storms (30-year average is 12.1 Named Storms) – 8 hurricanes (6.4) and 2 major hurricanes (2.7). Accumulated Cyclone Energy (ACE) was about 124% of average seasonal activity. With four Named Storms resulting in nearly 10 billion dollars of insured loss so far, it was no doubt a costly season. When also considering the human toll along with too many broken meteorological records to mention, this season will be remembered for decades to come. It appears that there are three leading reasons for this forecast bust, two residing in the oceans and one in the upper atmosphere. If you recall, there was a lot of talk about how cold the sea surface temperatures (SST) were across the Atlantic Ocean, particularly in the Main Development Region (MDR), from April through July. A lot of the seasonal forecasts believed that these notably cooler than average ocean waters in the tropical Atlantic would be likely to persist into the heart of hurricane season and keep the Cape Verde named storm activity in check, resulting in lower named storm counts overall. Instead, Atlantic SSTs warmed suddenly back to near normal in August. While still nowhere near as favorable as conditions in 2017 or 2005, this warming gave just enough lift to peak-season African easterly waves like the one that spawned Florence. I would say the next reason would be on the failure for El Niño to fully develop in the central Pacific Ocean. If a stronger El Niño had developed, it would have helped increase the vertical shear over the Gulf and Caribbean. 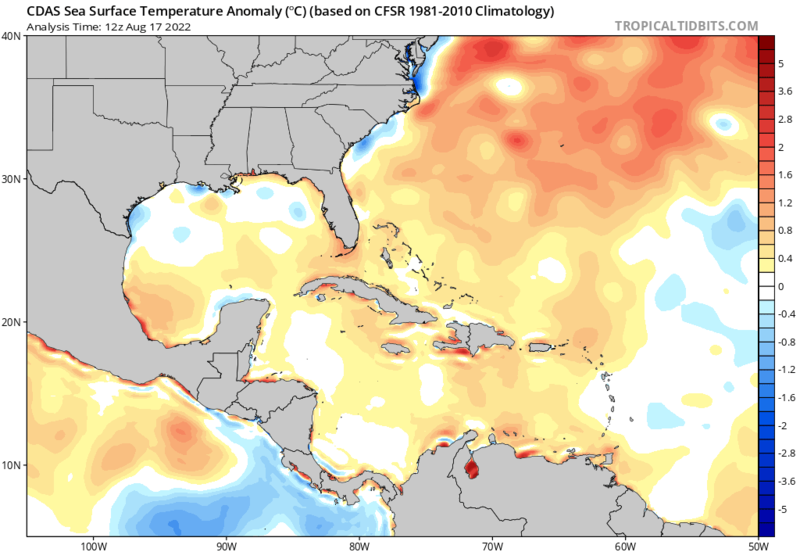 However, the SST stayed in neutral territory before lurching suddenly towards El Niño in early fall, which was a few weeks too late to spare the Florida Panhandle the worst of Hurricane Michael’s fury as it strengthened right up until landfall. Above are the SSTs from the beginning of June (Left) and end of August (Right). Highlighted in the boxes are the areas of SST anomaly over the Atlantic Ocean and the Pacific Ocean, which show the warming of SST in the Atlantic and the overall lack of SST change in the Pacific (warmer waters would favor El Niño). Lastly, looking back at the BMS Tropical Outlooks that were issued this past spring, they really pushed the fact that the Madden-Julian Oscillation (MJO) would be the key to the season, and pulses of activity would be key to new Named Storm development. It seems that the final factor contributing to the poor forecasting season would have to be the bad luck the MJO played in the timing of the overall Atlantic basin pattern. One of these strong MJO pulses coincided with both the primary climatological peak of hurricane season in early September and the secondary historical peak in early and mid-October. These MJO pulses explain why the 2018 season felt so “lumpy,” with long quiet periods punctuated by dizzying, multi-storm bursts of activity. As the peak of the Atlantic Hurricane Season neared, the MJO come to an active period as highlighted by the black circled areas. There are many lessons to learn from the 2018 Atlantic Hurricane Season. One that might tie in well with the forecast bust is that there can be incredible variability during a hurricane season, which is why there needs to be less focus on the seasonal forecast numbers and more focus on interseasonal forecast, which can capture variables like the MJO and help define where storms may track when the activity starts. These interseasonal forecasts are performing well on a three-week time frame and can provide the insurance industry with insight on whether the period will be busy or quiet. Speaking of forecasting, this past season was a great example that even the best forecaster in the world can’t nail down hurricane intensity even in a short-term forecast. Hurricane Florence and Hurricane Michael showed hurricane intensity forecasting has a long way to come. Three days before Florence made landfall, it was forecasted to be a gigantic Category 3 hurricane but ended up being a large slow-moving Category 1. Michael was only a tropical depression three days before landfall, and at the time was only forecasted to be a weak Category 1 hurricane. That’s a long way from the storm that ensued, which was one of the strongest on record. However, maybe all of this focus on the category of a storm should be another lesson to learn, as we experience time and time again that this focus can be too narrow. Insured impacts don’t revolve around the Saffir-Simpson Hurricane Wind Scale (SSHWS). As the name indicates, the familiar category scale is based only on a hurricane’s maximum wind speed, and thus sometimes fails to capture the true danger of large, slow-moving storms. When Florence dropped to Category 1 on its approach to North Carolina, some residents took the storm less seriously as a result, despite no decrease in flood risks. Alternatives to the SSHWS have been proposed, but in my opinion, all attempts to compress a hurricane down to a single number will have problems with oversimplification. Rather than discarding the venerable SSHWS, the answer could be as simple as expanding the role for overall hurricane threat and impact forecasts, which is the general purpose of the many BMS Tropical Updates provided before a storm makes landfall. The BMS Tropical Updates often try to break down the insured impacts of wind, surge, rain, and tornado risks that, with any hurricane, can range from minimal to extreme. Another thing to remember and consider is that the forecast of a below normal or an above normal season doesn’t necessarily map to low or high chances of a hurricane landfall. With four named storms making landfall this past season, the insurance industry needs to keep its sights on the overall risk of named storm impacts. The catastrophe models are an important gauge to the overall risk during any given season. Seasonal hurricane prediction is an inexact science, and likely always will be. No matter what the numbers say for 2019, you need to look at the long-term risk and make slight risk management adjustments during the interseasonal forecast periods. Know the threat before it's a threat, and you steer the outcome. An end of #hurricaneseason thread.